Douglas Brodie is an ex-soldier, ex-policeman now working as a crime reporter in Glasgow in the late 1940s. His landlady, also his girlfriend, is an advocate. She asks him to investigate a series of burglaries that are targeting the Jewish émigré community when the police seem to be ignoring the crimes. At the same time she is asked to go to Germany to assist with the ongoing prosecution of Nazi soldiers. Douglas reluctantly starts to investigate but soon finds a link with Germans fleeing the prosecutions - someone appears to be helping certain high level officers escape the justice of the courts. He is coerced into going to Germany to give evidence regarding the interrogations that he undertook of some of the prisoners. Enlisted again into the army with a temporary promotion he uses the opportunity to further his enquiries into the escape route on behalf of the secret services. As his investigations lead him closer to the Germans he is seeking, he realises that he, his amateur team of Jewish helpers, and his ex-policeman friend Danny, have a traitor in their midst - and it seems that they are not the only people hunting on the streets of Glasgow. PILGRIM SOUL is a very exciting, but harrowing, story. Very well written and with well rounded characters, I thoroughly enjoyed it. There are quite graphic descriptions - or perhaps that was my imagination filling in the gaps - of the atrocities carried out in the concentration camps, not only the deaths of millions but also the way that prisoners were experimented upon. I am not a fan of war novels, so my enjoyment was a surprise to me. This is not a novel for anyone of a nervous disposition but I recommend it as a good read. One that will remain with me for a long time. 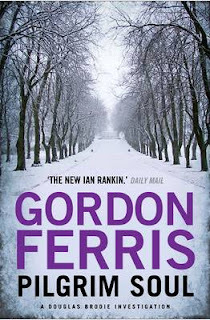 Gordon Ferris is someone on my must read list - I must read the others in the series. Read another review of PILGRIM SOUL.